Need to get rid of a tattoo for a job? Tired of looking at faded, ugly ink? Contrary to popular belief, you don't have to be stuck with a tattoo forever. We provide tattoo removal in Sun City West, AZ, that leaves you free of unwanted designs on your skin. Whether you've got a small tattoo in one spot or a large one covering an entire limb, we have the solution for you. 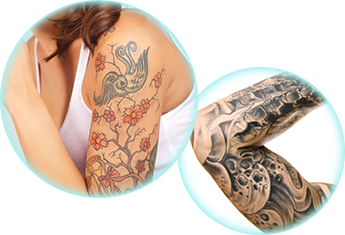 Our tattoo removal service can handle any size, ink, skin type, and color. Each one will look as though it never existed after a session from us. We use only the most recent technology, which is non-invasive and extremely effective. Tattoo removal uses laser energy to break up and disperse tattoo pigments safely. Our salon is brand new, so you can trust that everything is up-to-date and in good condition. This, combined with our experienced and gentle staff, makes for the most pleasant appointment possible. Our doctors have all the needed knowledge and will cater your treatment for your particular needs. At our tattoo removal company, we understand that sometimes your tastes and lifestyle choices change. That shouldn't mean you have to put up with the same mark for your entire life if you don't want to. Even if you do still like your tattoo, you may not like how much it's fading or the limits it places on your clothing and career choices. Many companies and military branches prohibit their employees from sporting visible tattoos, which can put a heavy limit on what they can wear to work. You don't want your skills and talents to be limited by your looks, and we don't either. Stop by our salon and we'll help you keep every door open. We use the Q-Switch ND: YAG Laser for tattoo removal. It is the most common type of laser used in tattoo removal, producing light pulses of extremly high peak power to target the different color spectrums at different wavelengths. The advantage to having removal done at Alycan Design Medispa is that besides the most updated equipment, we also have a calming ambiance that comforts clients as they undergo their treatments. We can make you feel much more at ease than the four white walls of a regular medical office can. Here we combine the expertise of the medical office with a soothing spa, so you can think of our tattoo removal service as something to look forward to. Although multiple visits may be required depending on your situation, each one can be completed in minutes or even seconds. You don't even have to worry about scarring. Laser procedures are the only ones that have been clinically proven to completely remove tattoos without leaving any scars. This is truly the ideal option; the last thing you want to do is replace one unwanted mark with another one. Contact us to get rid of your tattoo for good. We serve clients from Sun City West, Peoria, Surprise, Sun City, and Glendale, Arizona, and neighboring communities.